A birthday party is a great way to celebrate a friend or family member and show how much you appreciate them. 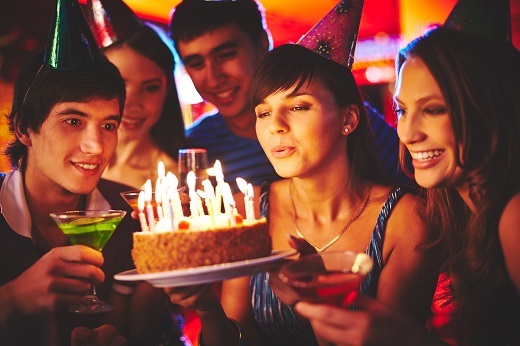 As a once a year opportunity, choosing the right activities and venue for your birthday party should be paramount, especially if it is a milestone birthday. Here are some of the reasons you should choose Stokely Event Center as your next birthday party venue. Atmosphere – Stokely Event Center has over 300 signs from Route 66 and nostalgic Tulsa locations to create a unique environment the moment you walk in. This décor has helped Stokely Event Center provide memorable experiences for many visitors over the years. If you are looking for a unique birthday party venue, we have you covered! Entertainment – Everyone loves to play old arcade games, especially when they are free. At Stokely Event Center, every guest in attendance will have the entertainment they crave during your birthday party. Stokely Event Center also provides a plug and play audio/visual system to help you provide a wide range of entertainment. Clean Up Provided – You work hard to plan the perfect birthday party and the birthday party venue you choose should allow you to enjoy the fruits of your labor. At Stokely Event Center we provide clean-up services when your event is over. This way you can focus on having fun instead of worrying about the messes that are being made. Menu Choice – Stokely Event Center understands that you may not want to use a caterer. For this reason, we allow guests to bring their own outside foods or bring a grill and cook their own foods on the premises. You have total and full control over what is served at your birthday party to ensure the best experience possible. If you are currently looking for a unique birthday party venue, Stokely Event Center can make sure your special day is unforgettable. Guests will love the free-to-play games and a wide assortment of decorative signs. With the flexibility of catering in outside food and drinks, event menus can fit a variety of preferences. Our sound system, projector and screen are included for one great price to meet your audio/visual needs. If you are interested in reserving Stokely Event Center, please call us at (918) 600-4448 or complete our online request form. We can’t wait to be part of your special event!